The Fuchs Elephant Charge 2017 is just around the corner - it will be held on Saturday 14 October, and 30 teams have already entered. The Elephant Charge is an extreme 4x4 event held annually, at a different location each year. It challenges teams of cars and motorbikes to complete a gruelling course through the Zambian bush. It raises considerable sums of money for conservation in Zambia, focussing on conservation through education. In the ten years since it began, the event has raised over $640,000 supporting 17 conservation organisations and projects. This has been distributed to conservation organisations working across the country. The exact location of the Elephant Charge is a carefully guarded secret until the day before the competition when directions to the charge site are released. It’s only then that the Teams are told where to meet for sign-in and vehicle scrutineering, and receive directions to their camp sites. Maps are issued to the teams on the evening before the race. The maps show the location and GPS coordinates of each of the ten checkpoints. Each team is also given - by random draw - a starting checkpoint. The Teams then frantically study their maps and pick their intended route, aiming for the shortest possible distance across the course while avoiding the chasms and peaks, and their own shortcomings. During the race, the teams must visit each of the ten checkpoints before returning to their starting checkpoint. Each team can visit the checkpoints in any order and in any direction they like. The Elephant Charge is about covering the terrain in the shortest possible distance and there are no prizes for speed. However, the race does have a time limit and, to be considered for the honours, each team must return to their starting checkpoint by 3pm on the day, having completed the course. There are bush roads cut to each of the checkpoints and these are marked on the competitors maps. These roads never give the shortest distance but teams can use them if they are running short of time or are having trouble convincing their vehicle to carry on! There are two Tsetse Lines on the course which teams can decide to attempt. Each Tsetse Line is between two checkpoints where the shortest distance would be extremely challenging. There is a special prize for the shortest distance achieved on each Tsetse Line. Support the teams or enter your own and take part in an extreme 4x4 event supporting wildlife conservation in Zambia. The Fuchs Elephant Charge 2017 relies on the sponsors who support Zambia's largest conservation fundraising event with donations, in-kind assistance and helping out through the year and on the day of the event. As much as the Elephant Charge is a whole lot of action-filled fun for the whole family, we all need to remember its great purpose - wildlife conservation. If we teach the young generation of today about the importance of wildlife and conserving it, we can put a stop to declining numbers of our beautiful wildlife and forests. The Elephant Charge supports projects and programs that are specifically designed to educate young communities living in those rural areas where wildlife live. They are being taught the importance of wildlife and how they can benefit from it. 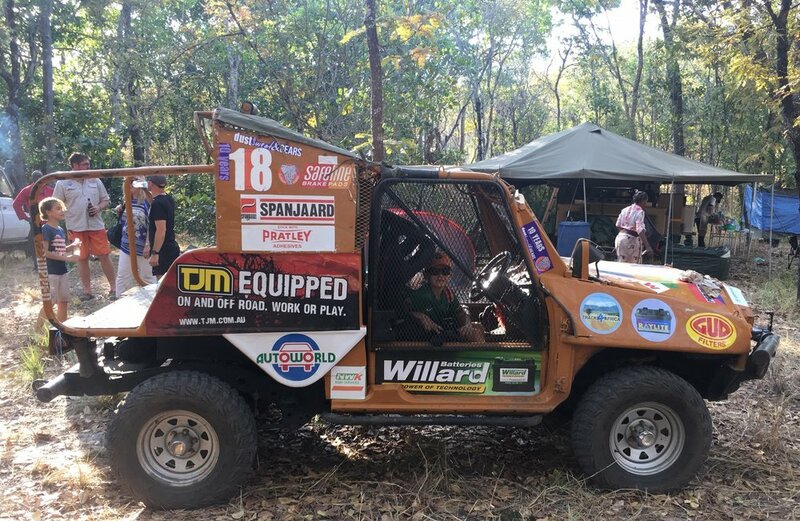 The Elephant Charge is an annual off-road motorsport challenge for both cars and motorbikes that raises money for conservation and wildlife education. Autoworld has been competing in the Elephant Charge for the last 5 years. In 2014 after a whole year of preparation, it was finally a win for Team Autoworld. Winning the Elephant Charge had been one of my biggest dreams. Now let’s see if we can make it a double! It's been a few months since I smelt the fresh air of the Zambian bush. For Easter I decided to take my family to South Luangwa National Park, a place I have never visited before. I quickly loaded my car the night before we started the 10 hour journey. Once I had all the family in the car and ensured we had all the essentials for the weekend I turned on my Garmin Montana 650 GPS equipped with Tracks4Africa Maps. The GPS gave me the full route we were to travel to the bush camp including the arrival times that were all spot on. We spent the next few days driving on our own through the South Luangwa Park without any fear of taking a wrong track or getting lost. This was due to the fact that we had every detail of all the game viewing roads in the park including the points of interest such as scenic spots and view points all displayed on the Tracks4Africa Maps. The Tracks4Africa Maps is a map that is specifically designed for outdoor enthusiasts traveling through Africa. It includes a lot of detail of all the important points of interests in towns and cities. It also has details of all the lodges and campsites and all the information that would be beneficial to those travelers like me that just love to be on and off-road exploring. Tracks4Africa Maps also has most of the rivers and lakes including river tracks where a boat could easily find its way through rocky or sandy parts of the rivers. If you've enjoyed this post and want to read about more of my 4x4 adventures, check out the Explore Zambia category within the news section on the Autoworld website. I am sure every camper knows the benefits of having a compact camping kit. The less you carry and the more organized you are, the less job you have to set the camp up and you can begin your holiday in the bush sooner! A couple of months ago I wrote about how I TJM equipped my Hilux for exploring the Zambian bush and this past month I’ve taken my exploring across the border with my family of 5 on a 5400km trip in 2 weeks through Botswana and Namibia. In order to prepare for the trip, I spent the last few months converting my double cab Hilux to a full time camping “machine” with all of the essentials to be fully equipped to travel this journey. I had to think practically, saving all the space where I could so that the vehicle is light, yet at the same time has all that I needed to be comfortable. My biggest challenge was how I would accommodate my family of 5 in a tent that is both quick to set up and at the same time does not take up much space. I still needed to have enough room to load my fridge and all the accessories needed for 3 kids and 2 adults for a period of 14 days on a 5400km journey… not an easy task! I searched the Internet and found a brand of tents called EEZI AWN. The EEZI AWN brand has been in the business of tents for the last 29 years and exports their products all over the world. I decided to look at all the options available with EEZI AWN and found exactly what I needed. This was a rooftop tent with drop sides that allows a top and bottom area, which had enough room at the top for 3 kids and a separate area to accommodate my wife and I. At the same time the tent is not very heavy and is made of 100% rip-stop canvas to withstand the cold conditions that sometimes go below zero in the Namibian desert during the winter months that we were traveling. I also needed some shade cover for the spots where we would be camping in the desert country where there is no shade so this called for an Awning. I found the perfect sized Awning compatible to fit on my aluminium canopy so that we could have some shade cover when we needed it. When all of the equipment arrived at Autoworld and our workshop team installed it we had quite an audience around the car. They thought I was crazy and planning a trip to Mars with all of the accessories on the car! Unfortunately I did not reach Mars! But the EEZI AWN equipment worked so well and it passed the test as my wife and kids did not complain of the cold and are all looking forward to my next destination so I am working on my maps again! I realized that there must be many campers out there facing the same problems that I experienced. So in our quest to continually care for our customers and expand our outdoor product line at Autoworld we are delighted to announce that we are now the official dealers for EEZI AWN tents & Awnings in Zambia. Our first shipment of EEZI AWN tents will be arriving in Zambia soon. We will shortly have the tents on display in our showrooms so all of you keen campers can come and have a look for yourselves and I’m confident that you’ll find exactly what you’re looking for. This month there's no stopping David Findlay as he shares with us how the Garmin products have helped him explore Zambia with his 4x4, on his bicycle, hunting with his dogs and next up on the list...in the sky! As I explained in my last blog post about TJM products, the African bush is really a great passion of mine, be it fishing, hunting or trailing through the great Zambian wilderness in a 4x4. The one piece of equipment that I never leave home without is my Garmin GPS (Global Positioning System). We introduced the Garmin range of GPS units into the Autoworld stores a few years ago and when I first had the opportunity to try one out I was so impressed with what it had to offer me. With a wide range of maps available for Africa my Garmin GPS enables me to drive into any country or town and know exactly where to find the next filling station, shopping centre or restaurant, which comes in really handy with a car full of 3 kids! Some of the GPS units are multifunctional and can be used as a camera, video game unit to name just a few of the features. There is a new model recently launched by Garmin called the Nuvi 2595. This little unit is specifically designed as a driving GPS and is my favourite. It has a touch screen and for those of us who are lazy to reach over to the screen you can voice activate it so that the unit will understand your voice commands. If you are not keen on reading maps it has a function that will give voice prompted turn by turn directions with spoken street names so you can just focus on driving without looking at the screen. It even advises on the correct lane to drive in when approaching unfamiliar intersections and shows you pictures of the junction in advance so you know what you will be approaching. The unit can also be paired with a mobile phone to act as a hands free set in the car. Gone are the days of a police officer catching you red handed with a phone against one of your ears! There’s literally a suitable GPS for every need and I can't recommend them enough. Before I discovered the fun of off-roading and quad biking, I was a keen cyclist and loved using the Garmin fitness watch with the cycling cadence tool to help record my performance. Garmin provide a full range of watches for the fitness junkies so for example while running it will help record how many steps you take on your run, how high your heart rate is, the distance you have run and the calories you have burned. All this information can be stored automatically enabling you to be your own gym instructor monitoring your progress by month or by year and even send the information to your computer for safe keeping. Some of the watches are fully water proof and can be also used while you swim. The only button I cannot find on the Garmin fitness watch is the button to help me lose weight quicker! If you frequently take long walks with your dogs something that might interest you is the Garmin Dog Collars. Simply fit the collar to the dog and you wear the hand set unit that comes supplied with the collar. This will immediately keep you informed about where your dog has gone. I use the Garmin Dog Collars on my dogs when I go hunting and I find them invaluable! If your dog wanders away in the bush you can track it down from up to 30-40km away. So as you can see there's not a single area of your life where Garmin isn't welcome - in your car, on your boat, in the air, in the great outdoors or training in the gym. If you're curious to see how Garmin can transform your life visit the Garmin web page for more information and make an enquiry via our website and we will gladly help you find the right Garmin product for you! Next on my wish list is the Garmin device for aviation when I learn how to fly! Last month you heard from the Autoworld Chairman, Noble Findlay and this month we'd like to introduce you to our Purchasing Manager, David Findlay. David is absolutely passionate about everything to do with exploring the Zambian wilderness and most weekends he is out with his family of 5 discovering something new. He'll be sharing some of these adventures with you through our Explore Zambia news category which we are launching today. On that note, we hand you over to David… The African bush is really a great passion of mine, be it fishing, hunting or trailing through the great Zambian wilderness in a 4x4. There is no better feeling than driving through the bush in a vehicle that is fully equipped for any off road conditions. There are not many gravel roads in Zambia that my vehicle has not traveled on! A few years back TJM Australia signed an agreement with Autoworld to take on the sole dealership for TJM off road products. TJM is a company that specialize in off road suspension and accessories that range from shock absorbers to bumpers, 4x4 compressor pumps, winches, roof top tents and everything 4x4 under the Sun! I had the privilege of having my vehicle fitted with all the TJM products (which you can see in the image above) to both advertise and test them at the same time. After fitting the off road suspension which includes shock absorbers & coil springs as well as air suspension on the rear leaf springs of the vehicle, I am now able to travel at higher speeds on gravel roads with better steering control. I am always towing a boat and the vehicle is excessively loaded carrying camping gear to accommodate my family of five so I also fitted air bellows. These are little air bags that fit between the rear leaf spring & the chassis of the vehicle allowing you to inflate or deflate them and in the process they increase or decrease the height of the vehicle. It is a must for those that are always carrying heavy loads or towing a trailer. With no modifications to the vehicle all these parts are readily available at the Autoworld Downtown branch! An Aluminium 4x4 canopy may just be the solution! They come in many designs and can be custom built to suit your needs. With the canopy that I have it has a built in kitchen and work top area so camping equipment can be easily opened or stored away in the shortest possible time. Above the canopy I installed a TJM roof top tent that can be set up in a matter of minutes. This tent has a built in mattress saving lots of space. With all of these products installed on my 4x4 I am able to get to where I want to go with confidence and set up my camp quickly leaving me more time to relax and play with my family in our beautiful Zambian bush. For those of you interested in the 4x4 accessories or any information relating to your 4x4, feel free to send us an enquiry and we can give you all the advice you need.